Jane Goodall exhibits an enviable calm about her life’s third act. “I’m not afraid of death. Just the dying part; it depends what you die of. I don’t now what happens when we die. I just feel there’s something else. To me, death is kind of an adventure,” she reveals with ease as if she were ordering lunch. At 81 years of age Jane — known as the world’s foremost expert on chimpanzees, a UN Messenger of Peace and founder of the Jane Goodall Institute and the Roots & Shoots program — is traveling 300 days a year; a grueling schedule she declares ‘awful’ but she doesn’t hesitate to do it. 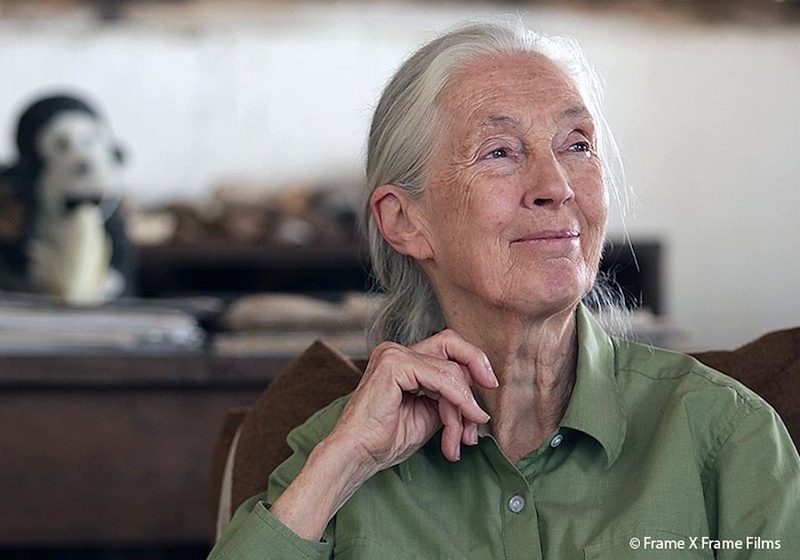 For a person who vehemently hates travel (but spends most of a year doing so), and often feels ‘intimidated’ and ‘insecure’ speaking at conferences, Dr. Jane Goodall illustrates an eternal, ferocious dedication to her causes. “I’ve got a message to give, and the only way I can deliver it is to be there,” she said to me as we sat by the window in a downtown Seattle hotel room recently; Jane’s petite frame enveloped by the armchair, her platinum hair pulled tidily in her signature low ponytail. “Electronic communication doesn’t have the same impact. I need to go back to the places where we started our program as much as possible before I kick the hoop or whatever it is that you do,” she added with a chuckle. “I’ve been immersed in trying to save 2 elephants that were here in Seattle’s Woodland Park Zoo, researching Puerto Rican parrots for my blog and contacting a lady in Hungary about the chimpanzees in the sanctuary there,” she reeled off as she explained that all of this is accomplished in just half an hour. “I’ve really stuck my neck out for this book I’ve become involved with, ‘Altered Genes. Twisted Truth.’ Of all the times in my recent books that I’ve mentioned GMO’s along with press conferences I have attended with the author, there wasn’t any backlash from Monsanto (America’s largest agrochemical and agricultural biotech company) until I went on The Colbert Report,” she says with a louder, puzzled tone. “As humans we can discuss the past, plan for the future and bring people together to solve problems. That’s what differentiates us from them, “ she explained. “That’s why it doesn’t make sense that we, as intellectual creatures, are destroying our only home. One of her life’s legacies, she says, is “Helping people to understand who animals really are.” She advises, “To connect the heart and brain, get into nature. When you have a relationship with some kind of animal it’s very grounding. During the few days of the year when Jane isn’t rescuing the animal kingdom, battling GMO’s or saving the planet, she’s walking her dogs in her hometown of Bournemouth, England, sitting by the fireplace watching ‘silly films’ with her sister and attacking some 13,000 emails that wait very patiently in her inbox. Dr. Jane Goodall is a recipient of The Minerva Award (2009). Created by former California First Lady Maria Shriver in 2004, The Minerva Awards became the country’s most prestigious awards given to women “who serve on the front-lines of humanity,” celebrating their extraordinary legacies of service and contributions to California, the nation and the world. Click here to visit awomansnation.org for more on her remarkable legacy.